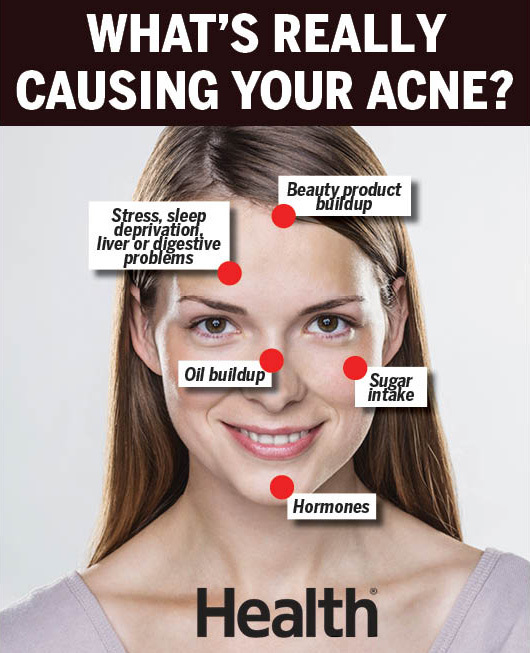 You can learn a lot about your overall health based on where pimples pop up on your face. Ever wonder why pimples tend to pop up in the same spot over and over again? According to an ancient Ayurvedic technique called face mapping, the location of your acne may have something to do with what's happening inside your body. Face mapping associates facial skin areas with different internal organs. When the practice was first developed thousands of years ago, the location of blemishes on the face helped doctors diagnose internal health problems. (They didn't have modern tools like X-rays, after all.) Today, the practice can still be used to help zero in on the health- or lifestyle-related factors that might be bringing on breakouts. "Our facial anatomy determines the type of skin in specific area," says Amanda Doyle, MD, a dermatologist at the Russak Dermatology Clinic in New York City. "The skin around our eyelids is 10 times thinner than the skin on the rest of the face. That's why facial mapping is very important in terms of caring for your skin," adds Dr. Doyle, who employs facial mapping before conducting all skin treatments at her office. The location of your breakouts can also help alert you to what type of acne you have, whether it's basic acne or the hormonal kind, Dr. Doyle says. It's safe to bet to blame jaw and chin breakouts on hormones, says Dr. Doyle. Hormonal acne is caused by an excess of the male hormone androgen (which includes testosterone), she explains; these hormones can over-stimulate the oil glands and clog pores where the acne bacteria grow. A hormone-related breakout might also occur about seven to 10 days before a woman's period. Breaking out along the hairline, near the ears, or in the cheek area can fall into the hormonal acne category, Dr. Doyle says. That being said, "I also think about exogenous factors, such as hair products containing oils and chemicals that can clog or irritate the pores," she adds. Acne in the cheek area can be a sign of high sugar consumption, says Dr. Doyle. Cleaning up your diet and limiting your intake of the sweet stuff may help cheek breakouts clear up. You should also be aware of how close you're holding your phone to your face. "Our cell phones are notorious for carrying germs, and the screen accumulates oil and makeup from pressing against our face," Dr. Doyle says. Clean your smartphone with a disinfectant wipe regularly to prevent transferring germs to your skin. Pimples here are often linked to the digestive system, Dr. Doyle says; they may be a clue that your body is having a hard time breaking down certain foods. Other possibilities? "[Forehead-specific acne] may also indicate liver problems, stress, or an irregular sleep schedule," she adds. Consistent forehead breakouts are worth bringing up with your doctor. The T-zone—forehead, nose, and down to the chin region—is generally a bit slicker because it has more oil glands than the rest of the face, Dr. Doyle explains. That makes it prone to blackheads and whiteheads. The makeup you're using can also bring on breakouts. "I see a lot of patients with clogged pores from using makeup that isn’t non-comedogenic, meaning that it does not clog the pores," she says. The best way to extract blackheads and whiteheads is manually at a dermatologist's office, Dr. Doyle says. Still, they often come back, she warns. "Topical retinoids can also help, as this serves to expel the sebum from the actual pores when used appropriately." Face mapping can be a useful starting point for pinpointing the cause of your pimples—but it's not foolproof. If your acne doesn't seem to clear up after a couple of weeks, or you have additional symptoms (stomach problems or extreme fatigue, for example, which may indicate something more serious beyond breakouts), make an appointment with your doctor. "It’s best to be proactive, and there are so many options to treat acne, Rx and non-Rx," Dr. Doyle says. "Talking to a professional who can customize your regimen and incorporate both is best. Many products, even some over-the-counter products, are not safe for use in pregnancy or breastfeeding as well, so having someone to guide you through that process can be helpful."